Thermocouples are digital thermometers that give users the fastest readings, delivering them in just 2-5 seconds. 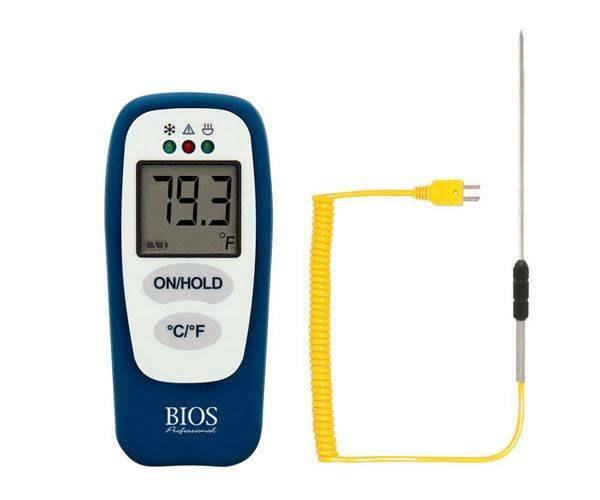 Thermocouple thermometers are designed for mostly professional use and are more expensive than traditional at-home digital food thermometers. They can be used for both thick and thin foods, designed to be inserted 1 cm or deeper into foods for best results. Thermocouples can be calibrated, but are only designed to check the internal temperature of food towards the end of its cooking time. Digital instant-read thermometers, also called thermistor, are the most popular type of at-home food thermometer, being found around the country in kitchen and appliance stores. Digital instant-read thermometers deliver readings in about 10 seconds, are designed for both thick and thin food products, and must be placed about 1.5 cm into food products to properly read internal temperatures. 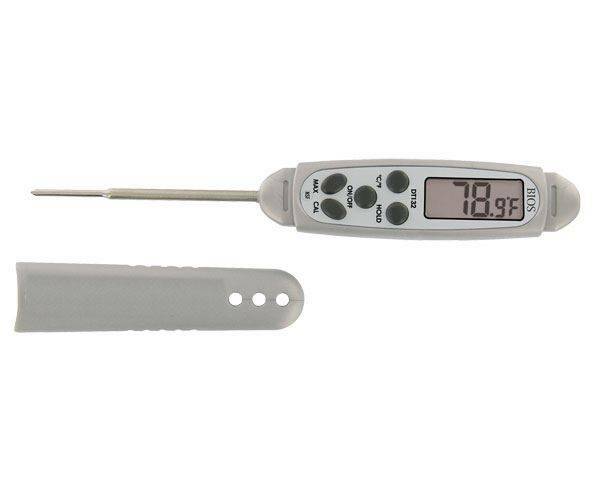 Like thermocouples, digital instant-read thermometers are meant to be used towards the end of cooking time. Some can be calibrated, but it may depend on the thermometer’s manufacturer. 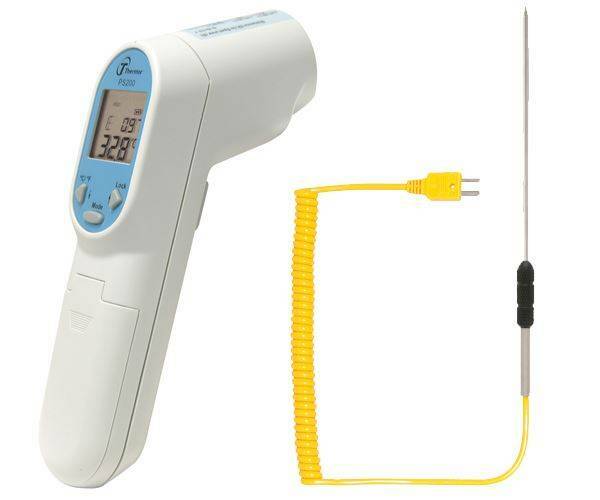 If you would like to purchase a waterproof digital thermometer, please visit the FoodSafetyMarket online store. Infrared thermometers are used to measure the surface temperature of items. They can be aimed at food in the fridge, freezer or being held for service in holding containers. These thermometers must be pointed directly at the food item with no obstructions – they must have a clear line-of-sight. Readings can be recorded to maintain logs for safety and quality assurance. 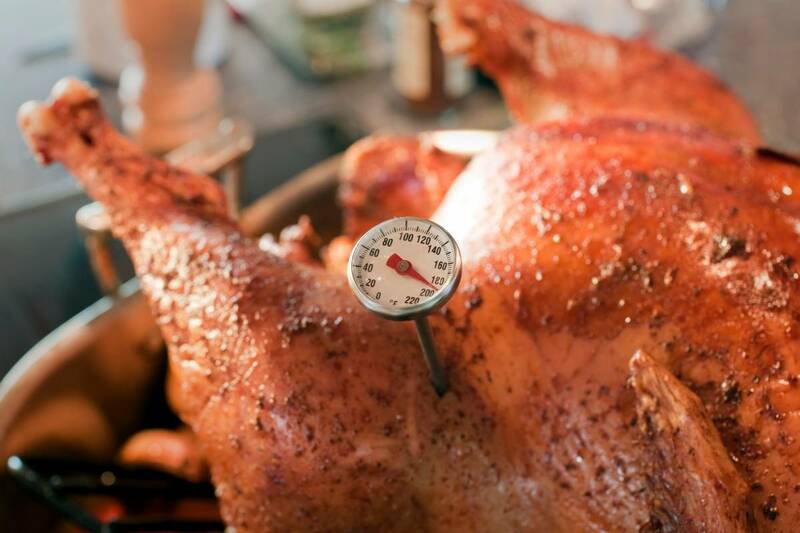 As surface temperature can vary significantly from internal temperature, additional readings from other types of thermometers should be used to ensure thorough cooking prior to holding. Dial oven-safe thermometers are slower than the digital equivalents, presenting readings within 1-2 minutes. 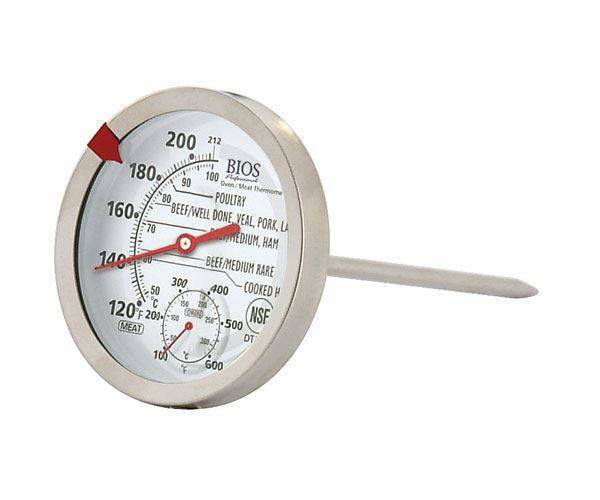 These thermometers are best used in roasts, soups, and casseroles, and are not designed to be used in thin foods. Unlike similar digital thermometers, these can safely remain within food while it is cooking, although heat conduction can sometimes cause false readings which may present problems. These thermometers must be placed at least 5-7 cm in the thickest part of the food being prepared in order to get a proper readout. Some dial oven-safe thermometers can be calibrated, but it is dependent on the manufacturer. Dial instant-read (or bi-metallic) thermometers are extremely common and deliver faster readings than their oven-safe counterparts. They are ideal for use in roasts, soups, and casseroles, and only able to read thin foods when being inserted sideways. 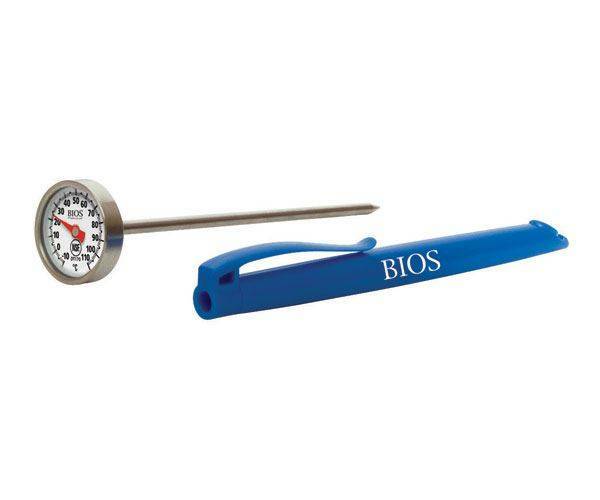 These thermometers are designed to read temperatures towards the end of cooking time, and must be inserted at least 5-7 cm within the thickest part of the food being measured. Certain models of dial instant-read thermometers can be calibrated, but it’s best to check with the manufacturer. 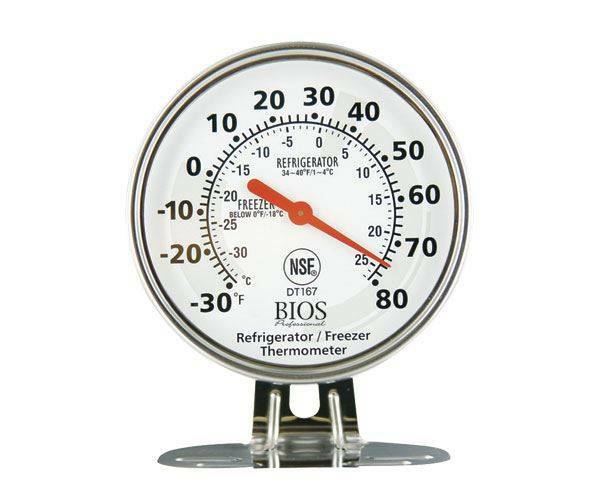 Thermometers designed to sit or hang in the fridge or freezer will allow you to see the air temperature for holding cold or frozen items. Ideally, for walk-in fridges and freezers, there should be one positioned at the front and another at the back. These should be checked regularly, and readings recorded in a log book. Before and after using a food thermometer, you should always ensure that it is cleaned and sanitized to avoid cross-contamination. When measuring the temperature any food type, it is important to insert the thermometer into the thickest part of the product, often found in the center of the food being prepared - remember to avoid touching bones when inserting a thermometer into meat products, and to avoid the bottom and sides of containers wherever possible. Before noting a temperature, you should wait for the reading to remain steady for at least 15 seconds. If the temperature still does not meet the minimum food safety requirements, corrective actions should be taken before eating the food. Your food thermometers must be regularly calibrated according to the specifications given by the item manufacturer to ensure that they are accurate to within 1°C (or 2°F). Your ideal calibration routine will see you recording any calibration results and the corrective actions taken for every thermometer or piece of equipment used. Calibration can be done in both an ice water solution and in boiling water - for more information on how to properly calibrate your food thermometers, you can view and order our helpful Guide to Thermometer Calibration infographic poster.